We're not likely to see LEGO Mass Effect anytime soon, but here's the next best thing: A huge, highly-detailed replica of the SR2 Normandy, complete with everything, constructed entirely out of those famous, colorful plastic bricks. How does one adequately convey the pure, uncut awesomeness of something like this without drooling on the keyboard and f-bombing everything in sight? 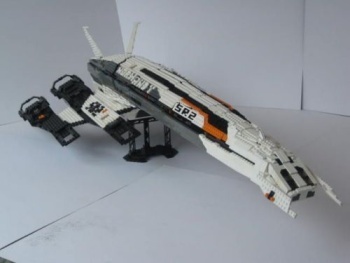 It's not easy, so bear with me: What we've got here is a 1.26-meter-long model of the Normandy, the real star of Mass Effect 2, recreated in LEGO with a level of detail that can only be described as freakin' stunning. How freakin' stunning? The main docking hatch aft of the cockpit opens and closes. So does the hangar bar. And you know what's inside the hangar bay? A freakin' Kodiak shuttle! With independently swiveling engines! And inside of that you can stick two little LEGO dudes! Then, of course, there's the retractable Thanix cannons. "The Thanix system was a little tricky to install," builder Ben Fellowes wrote, "because of the shape, location, size and need not only to be retractable without trace, but include cylindrical barrels which extend and retract back into the cannons themselves." Fellowes didn't reveal how many hours it took to build this beast, but I'm pretty sure it's not something he pulled off in an afternoon. This is an amazing piece of work, right down the Cerberus stand it sits on, and if I may be permitted to borrow a phrase popular among the young hipsters of the digital era: Do want. Get a look at the full collection of LEGO Normandy photos at MOCpages.com.